Ukrainian President Victor Yushchenko has said Prime Minister Yulia Timoshenko is responsible for the country's economic problems. In a televised address to the nation, Yushchenko demanded immediate amendments to the 2009 budget, saying the current budget does not meet the needs of the country's economy. Yushchenko also touched upon gas contracts between Russia and Ukraine, signed earlier by Yulia Timoshenko in Moscow, and said while negotiating with Russian officials she had not followed his instructions. 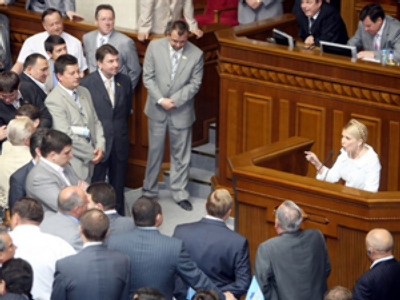 The parliamentary coalition of Timoshenko and Yushchenko broke apart in September 2008.